In part 2 of this 2-part “Get the look” style guide, I’ll show you how to bring a touch of Scandi style to your small bathroom, with “Lagom”. If you haven’t already done so, why not read part 1? Scandinavian style really lends itself well to smaller spaces in your home. With an emphasis on simple yet stylish design that is both functional and aesthetically-pleasing, it’s no wonder Scandi style is popular right around the globe. Roughly translating as “just enough”, Lagom is the perfect philosophy to live by, especially in a time when the average UK home is shrinking in size, reaching dimensions that were last seen in the 1930s (when records began!). Many of us are guilty of owning more possessions than we could possibly ever need, which is where Lagom kicks into action. 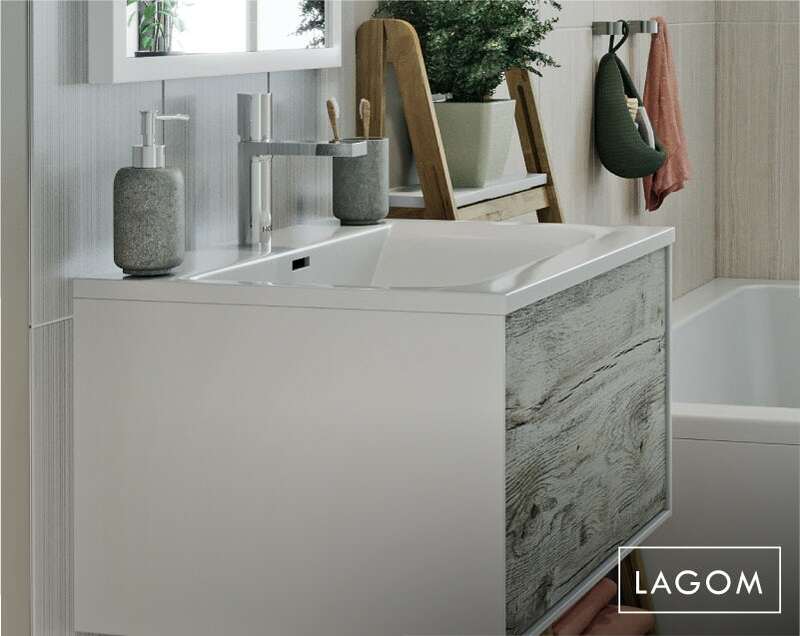 Lagom couldn’t be more perfect for a bathroom, which is typically a space that often isn’t much bigger than a king-sized mattress in terms of floor space. Clutter is one of the main reasons why people don’t like their bathrooms. With toiletries and items crowded round every available surface and items crammed into spaces, it can make your space feel claustrophobic, rather than relaxing. Plus, it makes your bathroom difficult to clean, and who wants to spend time in a dirty room? So, we’ve produced some tips on how to create the perfect small Lagom bathroom. Lagom doesn’t necessarily mean ruthlessly going through all your treasured possessions and getting rid of virtually everything you own. It simply means making sure you have “just the right amount” of things you need and want and focusing on those items which are more functional in nature. Don’t make any aspect of your small bathroom overly complex, ornate or intricate. A limited colour palette of soft neutrals will help achieve this. With Lagom, you aren’t trying to achieve a minimalist look, stripped back to the bare elements, so make sure you don’t take things too far. Relaxing colours are ideal, helping you to unwind—no bold shades that over-stimulate. If you feel the need for loads of accessories, you aren’t living the Lagom lifestyle. Houseplants should be your first consideration, as they offer a more sustainable element to your home environment, filtering and purifying your air, and then add any essentials like a towel ring or toilet roll holder. An art print or 2, containing elements of nature would make a welcome addition. Most importantly in a small bathroom, ensure your surfaces are clutter-free. Rows of toiletries and items indicate a cluttered and haphazard approach to life. A neat storage unit will help achieve this. Choose whether your bath, shower, toilet or basin will be your statement piece. The big functional items should be the things which catch the most attention. Aim to make one of these your focal point and complement with coordinated designs. You can use some old tips and tricks to enhance the feeling of light and space in your small bathroom by adding a mirror. You could even paint the ceiling a lighter colour than the rest of the room, to give the illusion that it is a little higher. Your small bathroom should still feel warm, cosy and welcoming, so don’t skimp on elements like heating. Add selected soft furnishings if your bathroom feels a little sparse. Stepping out of your bath onto a simple bamboo duck board will give you as much delight, as it would stepping onto an expensive mink fur rug. Embrace the look and feel of natural as much as possible. Sustainability is at the heart of the Lagom lifestyle, so why not do your bit by upcycling an older item into something more functional for your small bathroom? It could be an old flower pot, repainted and used to store items or it could a jam jar, decorated as a toothbrush holder. 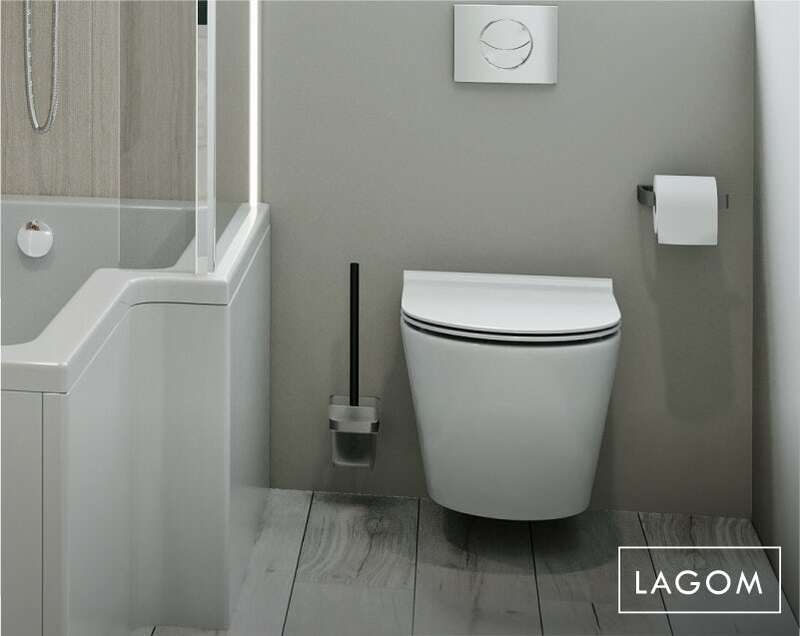 The Lagom concept ties into the notion of mindfulness, which we feel will be a big bathroom trend in 2019. 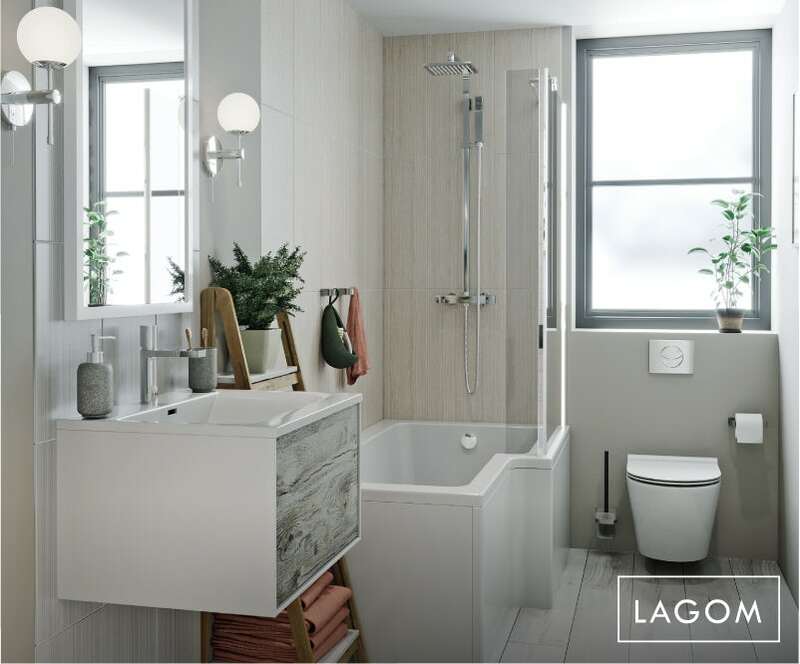 Your bathroom should be a place in which you can focus on your emotional, spiritual and physical wellbeing, which is why Lagom is capturing the imagination of people right around the world. If you like the look of our Lagom bathrooms (big and small), check out the featured products below. And why not browse the rest of our “Get the look” bathroom style guides and discover more great, on-trend designs. With the busy lives we lead, it's never easy finding time to relax and think about our own well-being. The bathroom is the one place we can truly chill out, so why not take a look at our 4 ultimate bathroom relaxation tips?